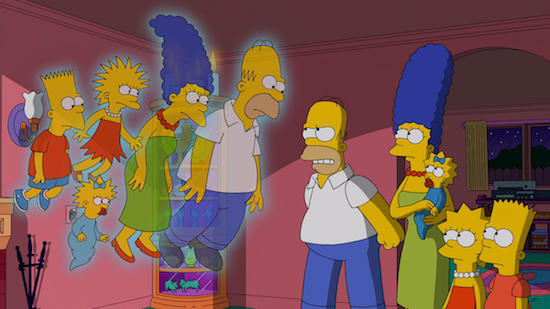 THE SIMPSONS: Horror film “The Others” is spoofed in the all-new “Treehouse of Horror XXV” episode of THE SIMPSONS airing Sunday, Oct. 19 (8:00-8:30 PM ET/PT) on FOX. THE SIMPSONS ™ and © 2014 TCFFC ALL RIGHTS RESERVED. THE SIMPSONS’ “Treehouse of Horror” installments are a Halloween staple, and now FXX is making it easy for fans to marathon the installments. On Wednesday, October 31, FXX will air the first 28 episodes installments—excluding this year’s “Treehouse of Horror XXIX”—in chronological order, starting at 8/7c in the morning and running until 10/9c at night. The episodes include parodies of TWILIGHT ZONE episodes, THE SHINING, NIGHTMARE ON ELM STREET, Edgar Allan Poe’s “The Raven,” MR. & MRS. SMITH, E.T., and more.